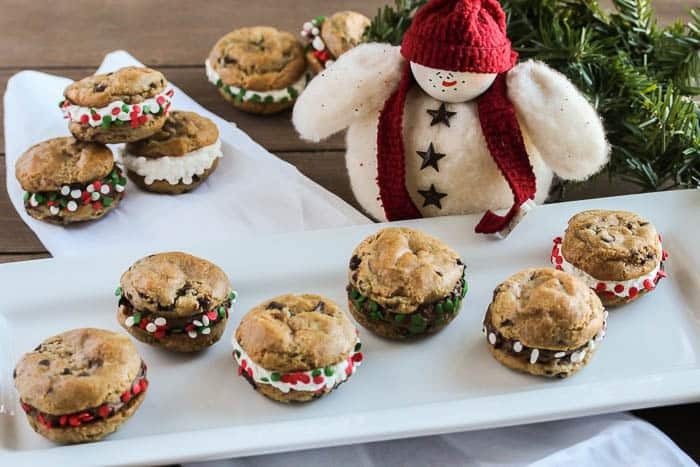 Keep the holidays as stress -free as possible with these Easy Gluten Free Christmas Cookies! I have always loved baking and I have a pretty serious sweet tooth. You can count on me to find ways to incorporate homemade goodies into our lives all year long. But, come Christmas time, the amount of baking I have to do just doesn’t always fit into the time I have to do it. Does anyone else feel that as the days get shorter, an hour or two seems to go missing as well? 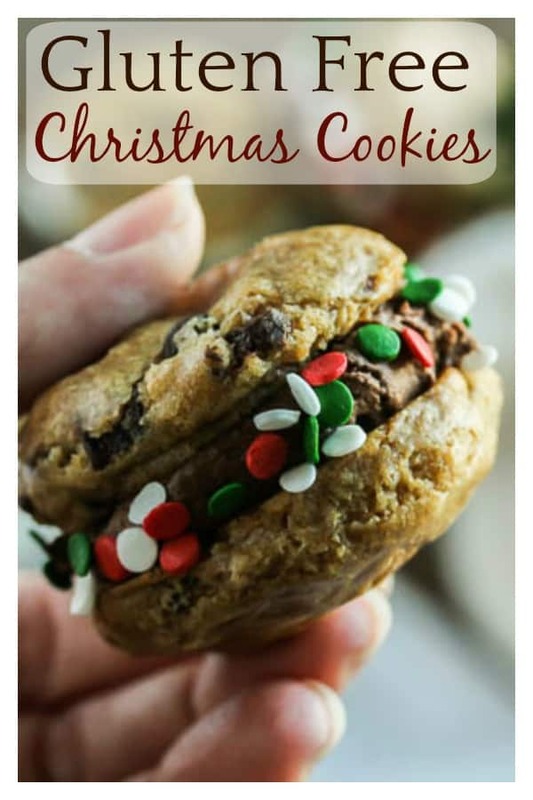 This recipe for Easy Gluten Free Christmas Cookies, isn’t so much a recipe, as a quick way to turn Immaculate Baking Company Gluten Free Chocolate Chunk Cookie Dough into a more festive treat! It’s great for people short on time, like me, or for those who just don’t enjoy baking from scratch as much. 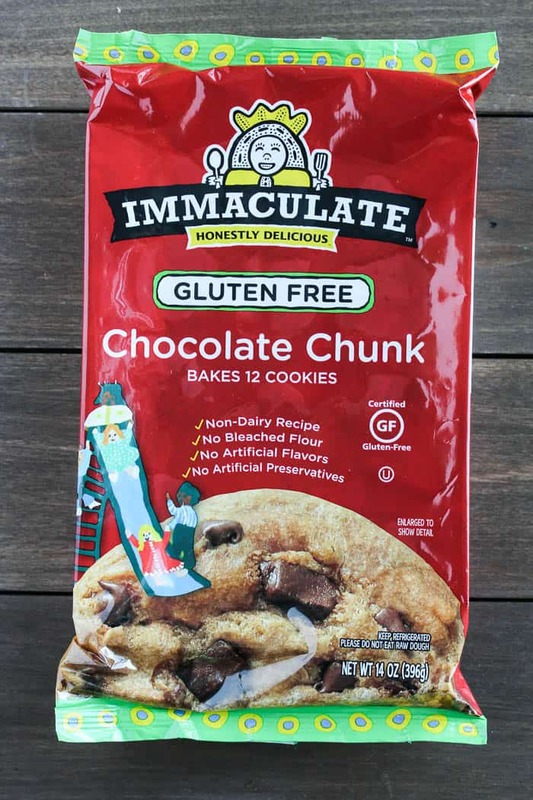 Immaculate Baking has, hands down, the best gluten free cookie dough I’ve ever had! I can’t even tell they are gluten free and they taste as good as homemade! They make for a great holiday dessert recipe that everyone is sure to love! You can print a coupon to save $1.00 on any Immaculate Baking Product here (for a limited time only)! There isn’t much prep work to do here since the dough is already made for you! Just preheat your oven to 350°F. Cut each portion of dough in half and roll into a ball. Place on a baking sheet about 2-inches apart. You will have a total of 24 smaller cookies. Bake for 10-12 minutes, until slightly browned on the bottom. Please note, this is slightly less time than what is listed on the Immaculate Baking packaging since the cookies are smaller. 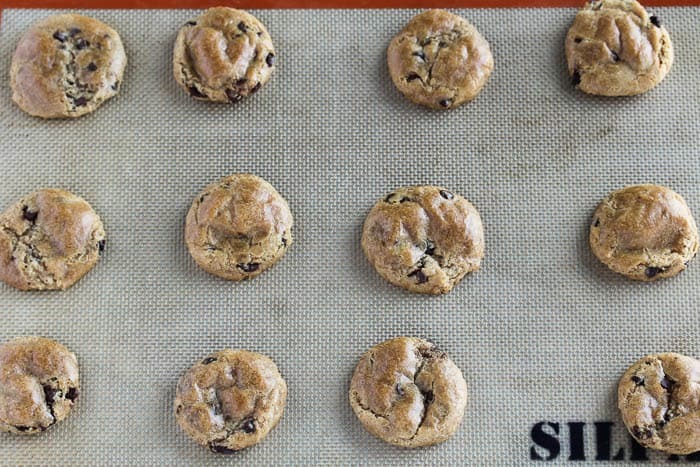 Allow the cookies to fully cool. 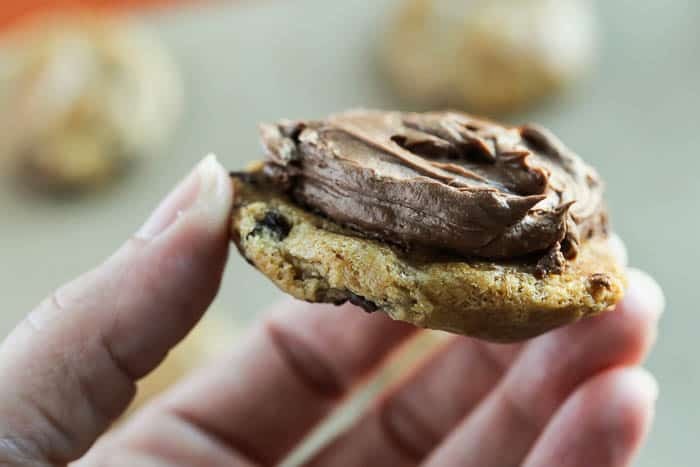 Once cool, add approximately 1 Tablespoon of the cake icing of your choice to the bottom of one cookie. Add another cookie on top to make a sandwich and press slightly so the icing just comes to the edge. Roll in holiday-themed sprinkles of your choice. Set the cookies out on a plain white, or festive serving tray and add some fun, little decorations around them. 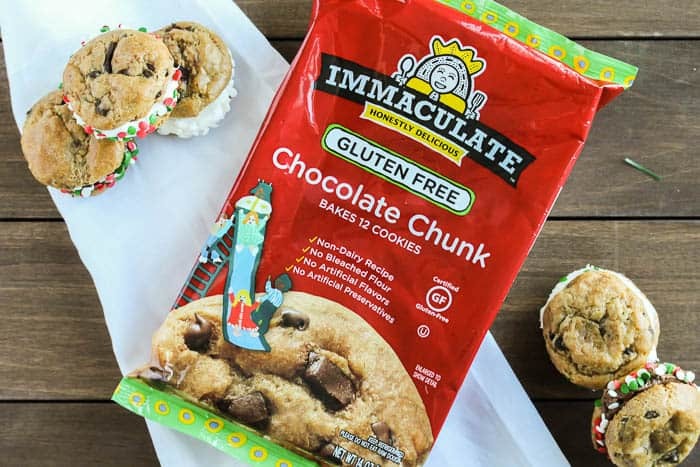 To learn more about Immaculate Baking Company and to print a coupon for $1.00 off your next purchase of any Immaculate Baking product, click here (limited time only)! Cut each portion of dough in half and roll into a ball. Place on a baking sheet about 2-inches apart. 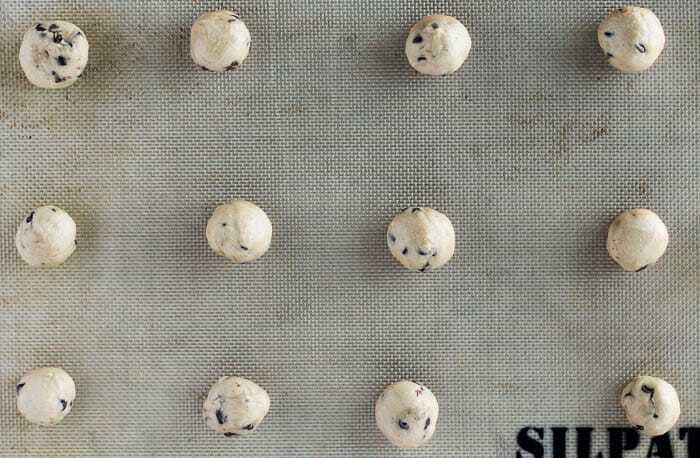 You will have a total of 24 smaller cookies. Bake for 10-12 minutes, until slightly browned on the bottom. Please note, this is slightly less time than what is listed on the Immaculate Baking packaging since the cookies are smaller. Allow the cookies to fully cool. Once cool, add approximately 1 Tablespoon of the cake icing of your choice to the bottom of one cookie. 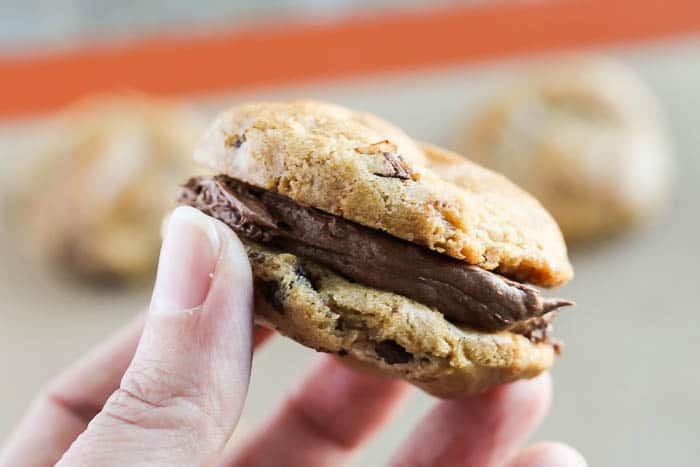 Add another cookie on top to make a sandwich and press slightly so the icing just comes to the edge. ** Nutritional information is an estimate and may vary. 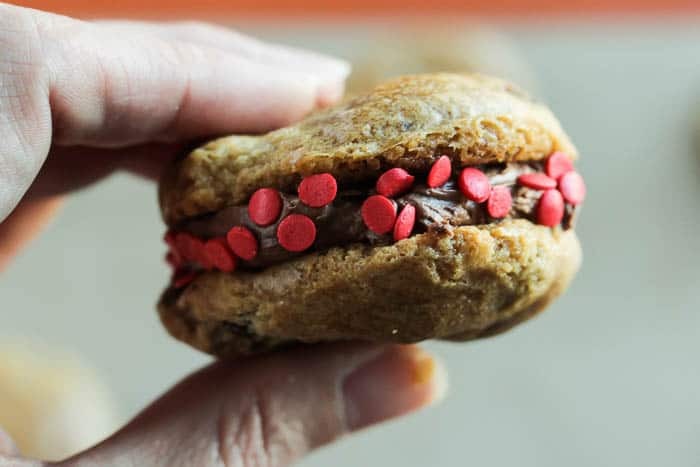 These cookie sandwiches sound and look really good! They’re very pretty and I’m sure that I won’t be able to stop at just one. What a festive way to make the cookies! Everybody loves chocolate chips … add some seasonal sprinkles and I’ll bet the plate is picked clean in a hurry!! I love shortcut recipes! 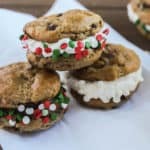 Those cookie sandwiches look adorable and so tasty! I definitely need to add this to my holiday baking list. Can’t wait to make these. Thanks for sharing! Love these! Chocolate + Christmas Season = AMAZING!!! Love that these are simple to make.